Thought it might interest this group. You sure that is a 2001? I ask because of the painted bumpers and I didn't know the 01 had side airbags. 2001 Limited Editions do have the side airbags in the seats. The wheels are from a base model. 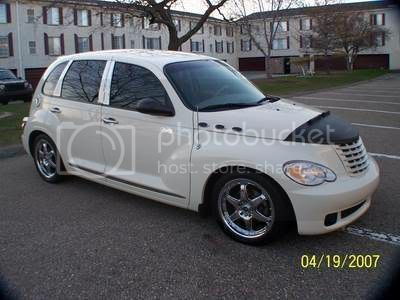 The PT Cruiser used was a European model due to the side marker lights. Yes, they most surely do have side airbags. In late 2002, I was involved in an accident where someone ran a red light and T-boned my 2001 Ltd in the middle of the driver's and rear doors. The side airbags saved me from serious injury. They really work and are worth every penny! I downloaded this video (long ago)from a European site. It seems that the link to the test on the US NHTSA site disappeared soon after the airbag ratings for the 2001 PT were first released in the US.